With their new NEO series, Manitowoc have gone to great lengths to guarantee the very best in self-contained ice making. 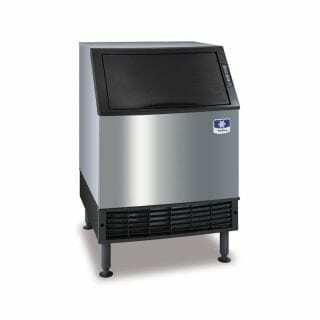 Their U-190 undercounter ice maker scores high across performance, intelligence, and convenience. Reliability and industry-leading ice production deliver a stellar performance—literally, since this model is Energy Star qualified. NEO machines are intelligent, too, with easy to understand display icons always keeping you in the loop: no need to check inside to confirm that the bin is full or that the clean cycle is on; the service icon will also notify you of any potential issues. You’ve even got the option to delay production (up to 24hrs) to save on running costs. The unit’s practical design enables you to reach refrigeration components simply by removing the forward-sliding, modular storage bin—no need to move the whole unit. Its pop-out air filter, the AlphaSan additive and the LuminIce accessory fight dust, bacteria and other nasty deposits. For an ideal undercounter fit, optional 30mm feet are available. Check out the other members of the Manitowoc NEO crew: the NEO U-140 and the NEO U-240 for different volume-to-storage configurations in the same compact undercounter size. This machine is great for: Restaurants, bars, cafes, coffee shops, office, healthcare, stadium boxes, front of house applications. A: The warranty is 3 years on parts and labour, 5 years on parts and 3 years on labour for the compressor, and 5 years on parts and labour for the evaporator.